A trailer bill of sale is a legal agreement between a buyer and a seller for the sale of a trailer vehicle like trucks, DMV or commercial scale vehicle. Whether you are buying or selling a trailer, or even transferring its ownership from one person to another, a valid Bill of Sale Forms is required to be created to show the secure transaction between the two parties. 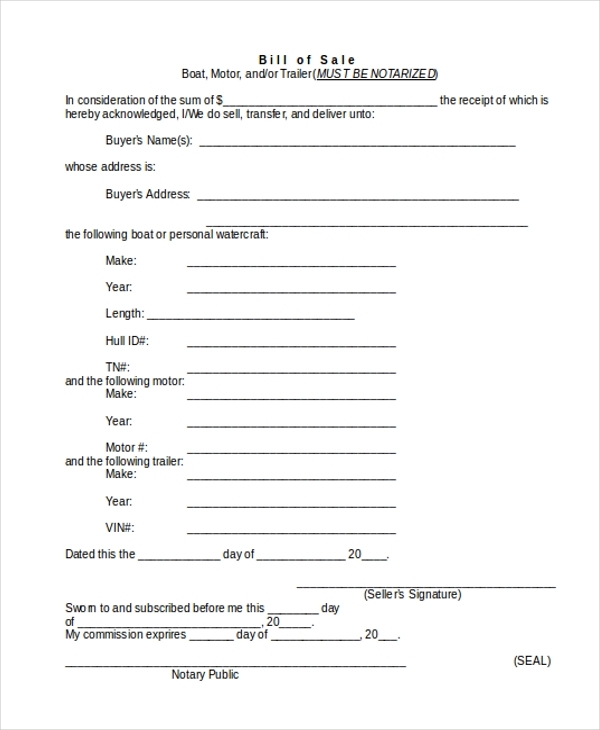 So if you need to create a legally recognized bill of sale for a trailer, get the below listed templates downloaded now. 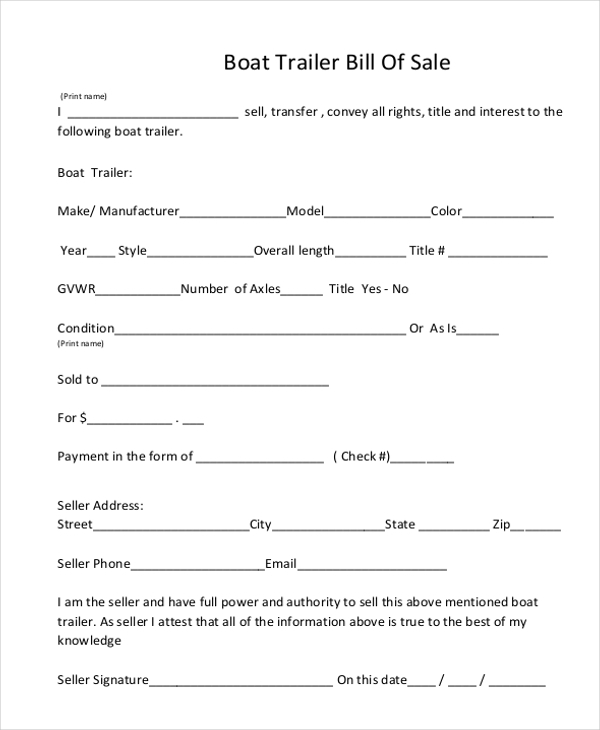 Here is the sample bill of sale for boat and trailer that is ideal to be utilized by the buyer or seller or both to have a written record of the sale of trailer. You may also see Boat Bill of Sale Forms. Check out this another free boat trailer bill of sale template available for download in PDF format. This agreement sample will include the complete details of the trailer along with its current condition. 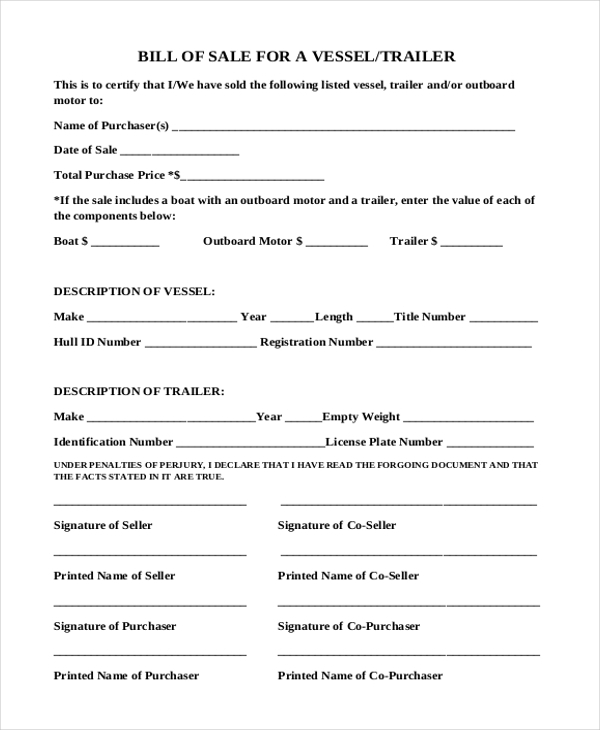 Here is another boat Motor trailer bill of sale sample for download that is perfectly designed to create a bill of sale document for boat motor trailer. Get downloaded now. 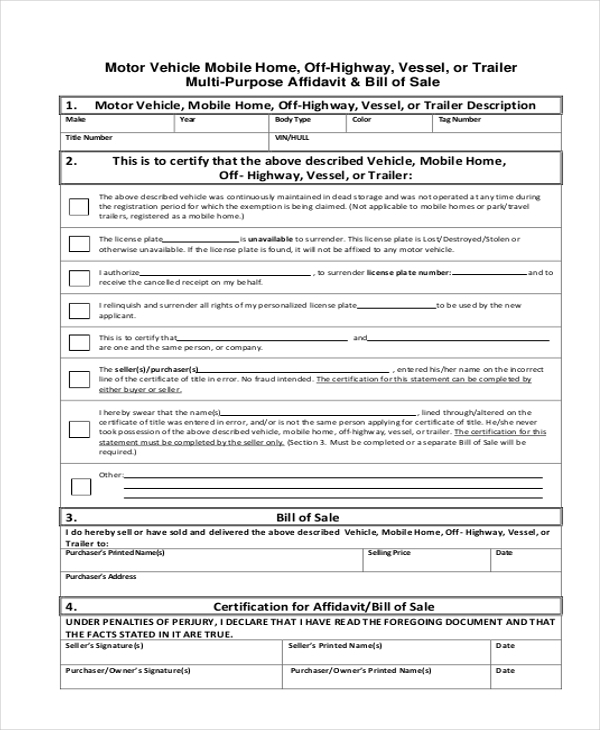 Whether you are buying or selling a horse trailer, create a legally recognized bill of sale document for showing a secure transaction using this sample trailer bill of sale. Download now. 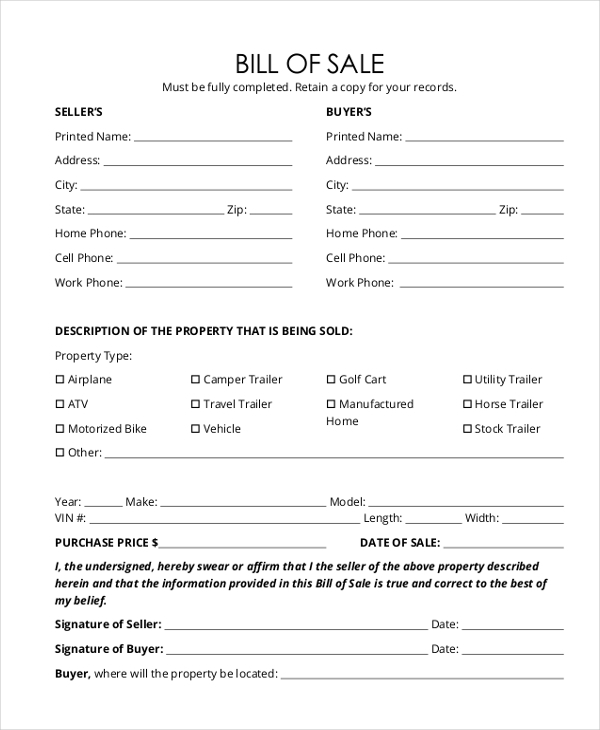 You may also see Horse Bill of Sale Forms. 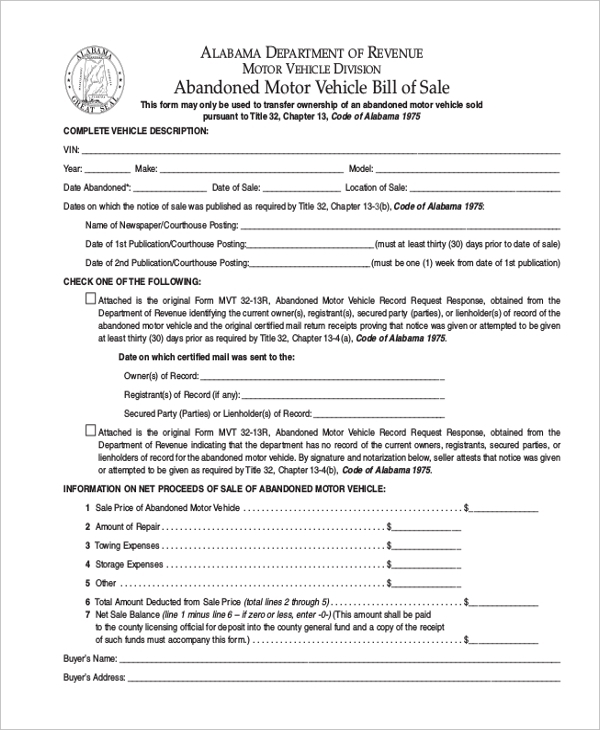 Here is another blank bill of sale document to help you create a thorough DMV Bill of Sale Forms for boat or trailer. You can also get it printed and customized as per your preferences. Need to create a bill of sale for trailer/vessel? 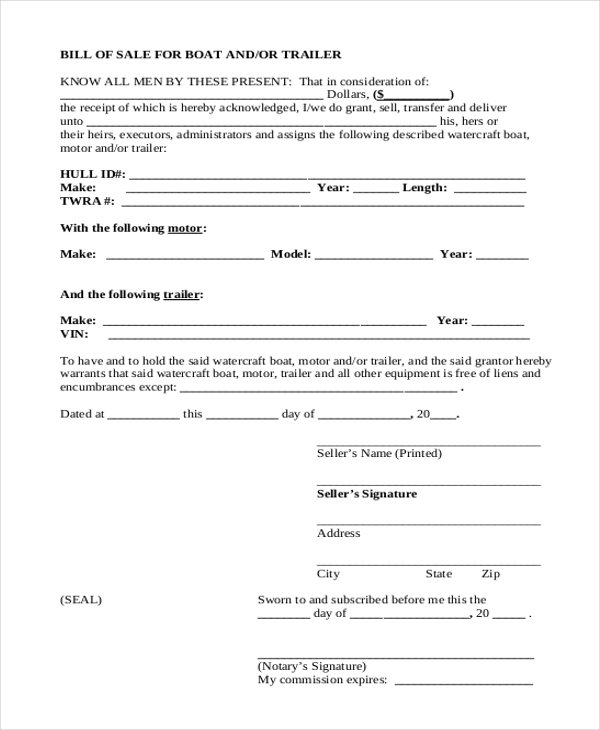 Get this template downloaded now and create a solid bill of sale document that can be recognized by the court of law. Download now. 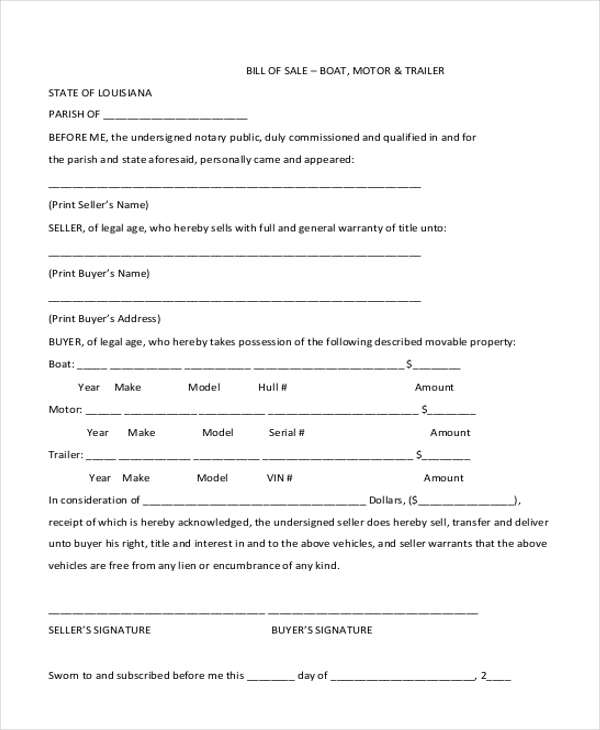 Create a valid and legally recognizable bill of sale document for the sale of utility trailer using this utility trailer bill of sale form. It includes complete details of the vehicle with its current condition. Whether you need to sale or purchase a travel trailer or need to transfer the ownership rights if it, prepare a solid trailer bill of sale record using this bill of sale sample available in PDF format online. 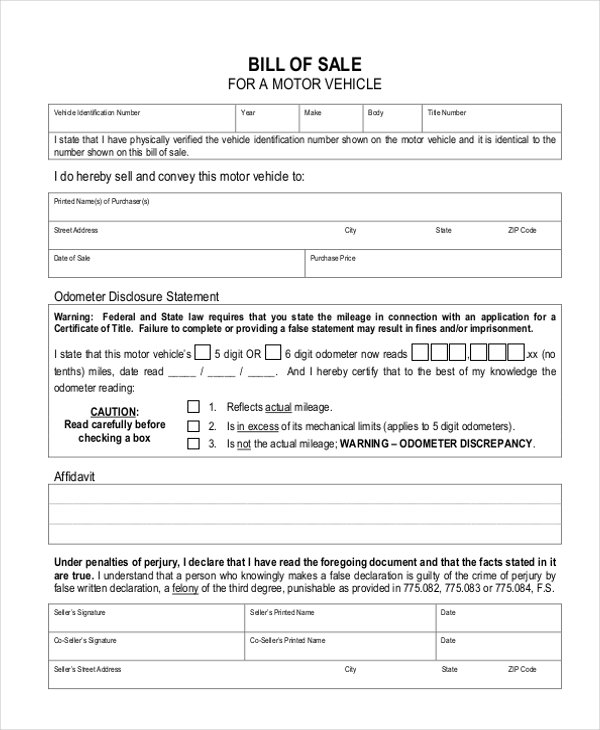 Here is the vehicle trailer bill of sale sample that is ideal to create a legally recognized bill of sale document for sale of a trailer, boat, truck or any type of commercial vehicle. Get downloaded in PDF form now. Why a Trailer Bill of Sale is Important? If you are buying or selling a trailer then in order to make the transaction secure, safe and lawful, it is crucial to create a trailer bill of sale that will describe the details of the trailer along with signature of buyer and the seller. Without a bill of sale, there may be chances of being a victim of fraud. Moreover, this bill of sale also makes it easier to transfer the ownership of the vehicle from seller to buyer. Even if you are a buyer then you need to ask your seller to make the whole selling prices lawful by creating a valid DMV bill of sale. You may also see Bill of Lading Forms. What are The Benefits of Trailer Bill of Sale? There are several benefits of using trailer bill of sale for both buyers as well as sellers a few of which are as follows. This bill of sale helps a buyer in transferring the ownership rights of the trailer without any hassle. A bill of sale signed by both the parties is always considered as a valid legal proof for the sale of a trailer. Hence can be presented in the court of law in the case of any dispute. These bills of sale also protect the rights of the sellers. If after sale any accident takes place by the trailer then by presenting a bill of sale a seller is not considered answerable for the accident. Do you find this trailer bill of sale important? Then find the suitable bill of sale samples from the list suggested above and get downloaded instantly to create a professional, thorough and clear bill of sale easily. These are available in PDF and Word formats and hence can be customized easily. You can also see Motorcycle Bill of Sale Forms.